Add a unique and stylish accent to your home with PID Floors Wood Floor 24 in. Octagon Medallion Inlay MT004. This beautiful medallion is made from real hardwood and can be installed into any solid or engineered wood floor, above, on, or below-grade. 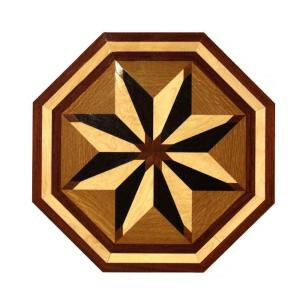 A decorative inlay will add value and warmth to your home or office, and can be used in a residential or commercial space. The wood species used in this medallion are Maple, White Oak, Santos Mahogany and Peruvian Walnut (from lightest to darkest). Buy online PID Floors 3/4 in. Thick x 24 in. Wide Octagon Medallion Unfinished Decorative Wood Floor Inlay MT004 MT0040, leave review and share Your friends.